The holiday season is upon us. We are all very busy and stressed. Easy dinners are the order of the day, yes? These oven baked tacos are a win on that score. They can be put on the table in about 30 minutes and are delicious. And there isn’t a big mess afterwards. I hope these help ease a little of the December stress in your life. 1. Preheat oven to 400. 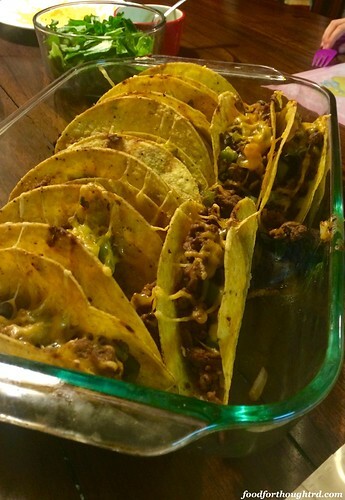 Line taco shalls in 9×13 baking dish. 2. Heat a medium to large skillet over medium-high heat. Add oil and ground meat. While it begins to brown, chop vegetables. Add onion, peppers, and garlic once meat is mostly browned. Saute, stirring occasionally, until onions are translucent and pepper soft. Add tomato, salsa, taco seasoning, and water. Cook for 5-10 minutes, until thickened and combined. 3. Spoon meat mixture into the taco shells. Top evenly with shredded cheese. 4. Bake for 5-10 minutes, until cheese is melted. Serve with desired toppings. Recipe notes: Don’t worry if your shells crack a bit trying to get them in the pan. Once you put the filling and cheese in, you can patch them back together. I would start checking the tacos at 5 minutes. The longer they are in the oven, the softer the shells become. Mine were in 8 minutes (convection oven) and the bottoms of the shells were almost too soft/soggy. The nutritional analysis uses ground turkey and doesn’t include in toppings. Refried black beans are a great side dish to serve with this.